The CoffeeShop Blog: CoffeeShop Photoshop Elements Action Install Tip! CoffeeShop Photoshop Elements Action Install Tip! This one is so obvious that probably I am the only person in the world that never thought about it. If you have Photoshop Elements you know what a pain it is to find the action folder when you need to install your CoffeeShop Actions. You have to jump through so many hoops just to find the photo effects folder.So the simple solution? 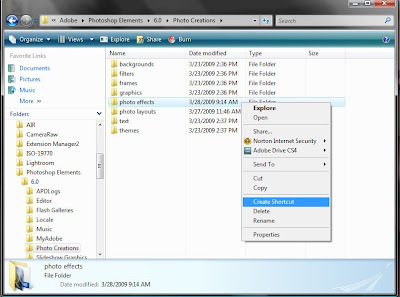 Just make a shortcut to your photo effects folder on your desktop! For some reason I did not figure this out until I got my new computer, but I hope to save others from making the same mistake. Find your photo effects folder and right click on it and "Create Shortcut". Then drag that shortcut link to you desktop! Now when I want to install my actions, I just click on my photo effect shortcut and drag the actions and thumbnails right in there! Or copy them from my Action file on my desktop and paste them there. In fact, you can make a CoffeeShop folder in your photo effect folder, make a shortcut of that folder, and then just drag the actions right in without having to open the folder on your desktop. That way you can organize your actions. I hope this helps save someone time. Oh, and make sure to backup your actions. You certainly don't want to have to download them again if your computer crashes! Evenings you will often find me in the back fields taking photos of the various "weeds" in bloom as the setting sun paints them in stunning light. This often involves me laying prone in fire ant beds or possibly on terrified snakes. I shudder to think of the thousands of snakes in our fields! I have been experimenting a bit with textures and wanted to give you a preview of my newest vintage clipping mask frames I am releasing next week. I used this texture from ibisb477 from Flickr and one of my vintage frames on this image I took last week. That shortcut is worth a million dollars..... If I had a million dollars I would certainly give it to you! I've spent tons of time not only loading my own actions but all my friends' actions too who can't seem to figure it out. Thank You!! I'm another one who hadn't thought to create a shortcut. Thanks for the suggestion! By the way, I love your actions! Loving it! I am in the process of editing some botanical shots taken at Huntington Library, for the wall in our bedroom. I really like what you did here, may have to apply some textures! I went thru a texture faze, early on in learning to edit, and for some reason, I don't use them as much. This makes me want to go thru my texture file and see what I can do. Thanks for posting this. Why in the WORLD didn't I think of that? It is honestly the reason I haven't upgraded- I have everything installed where I want it. :) Thanks for the tip AND your great stuff! OMIGOSH. Duh. I didn't think of that either- so THANK YOU! LOL! Love the photo and it's effects- can't wait!! Wow! I found your blog last week and have been in heaven ever since! I have been wanting to get into photography for years and finally jumped into by asking for a better camera and photoshop for Christmas. After I got everything, I didn't even know where to begin, I have PSE 6 and as I tried to edit, just felt myself become more and more frustrated because I thought it would be easier to know what I wanted to do with my photos. I'm still clueless about so many things, but your actions and tutorials have been God sent. Thank you Thank you Thank you! I have a couple of questions about the frames you can add to pictures and textures, that I'll try to e-mail to you so I don't take up an entire sidebar with my comment. Haha, I love how it is the simple things we always overlook. thanks Rita, this will make things a bit easier, although I have gotten pretty quick at clicking through the 501 folders to get there! Woo hoo!!! You think of the best things!! Genius! You are a genius... lol!! No really! I absolutely LOVE your ideas, actions and your website! Thank you so much for everything you have created!! I have one small problem, all of a sudden, the actions don't work. I can't do anything with them. They open, but nothing happens when I try to use them. Any ideas? Unfortunately I know nothing about PhotoShop, so it might be something simple I am missing. Can someone help me please? Thank you for putting into practice one of my favorite adages - What we need is not more elegant solutions, but more simple solutions that work elegantly. I can't find either the Photo Creations file or the Photo Effects file. Any suggestions. I am trying to install actions on a Mac and keep getting an error message that Photoshop Elements does not recognize this type of file. Any suggestions? I am stumped! Thanks, I love this site! I was fighting with finding the path for over 2 hours and I knew it was there. Thank you for the idea. I can't find this stupid file and I've looked on more than one occasion. If anyone has the path for Vista, PSE 5, please let me know! Great idea! I will do that! I managed to load the actions but the more recent ones I have done appear in my effects pallette but without the thumnail pic? what did I do wrong? I love your blog. But I haven't figured out the use of shortcutting the actions onto my desktop. I know that it would be a good way to categorize them but what about actually using them and getting them into the effects palette on PSE7? That is my problem. Hi, i love your blog and the tutorials. But i'm having a problem finding the folder to add the actions to. I have Photoshop Elements 8.0. Please help!!! I haven't figured out how to add the action to the photo I'm working on! Guess I'm way too naive to figure it out! LOL. I'm on a MAC. What is the file/path i should put it under if i have Windows XP with Elements 9??? I cant find this info/tutorial anywhere :( And by the way, you are awsome !! I just purchased PSE 9 and it's my first time using any photo editing program but I'm learning slowly. I have gone through the steps to download your actions for PSE users but cannot find them anywhere in my program. I am using a Mac, does that make a difference? Please help! I really want to use your beautiful actions on my photos! Thanks!! I need help period on installing the actions from the beginning step to the end for elements 10 please help help help! !